A 1991 Ennis High School graduate has coached four Colorado boys high school basketball teams to state championships. An Ennis high school student with her heart set on becoming a heart surgeon got a big boost toward her goal from a local business last Friday. ENNIS -- Local artist Kelsey Hubner always loved horses and taught herself to draw the beautiful creatures while she grew up on a ranch in Jeffers. 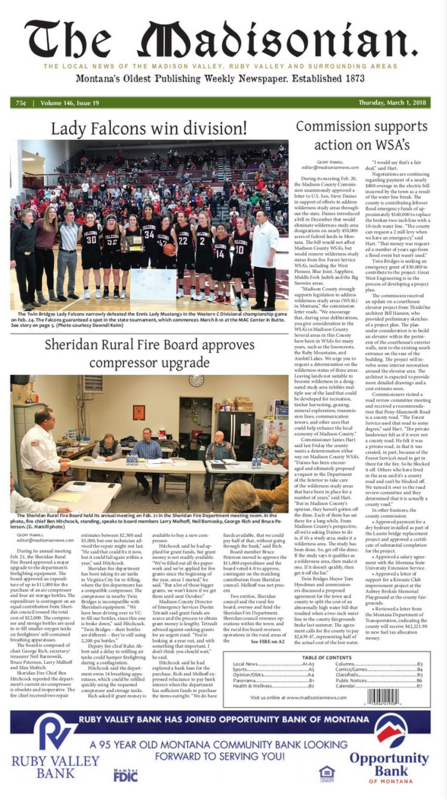 SHERIDAN -- Sheridan Town Council approved portions of a task order Monday that will allow Great West Engineering to begin work on a transmission water main to connect a new well to the town water system. Alice Gilbert is no stranger to the Ruby Valley. Born in Dillon, Gilbert’s roots dive deep into the history of the area after her great-grandmother homesteaded here long ago. Having moved around some as young girl, Gilbert always considered Sheridan home and still does. America’s SBDC Montana will join with the other 49 states’ SBDCs across the nation to celebrate SBDC Day on Wed., March 21. Nearly 1,000 offices nationally will join in promoting the core mission and successful outcomes of America’s SBDC program. “These folks really are the hidden gems of Sheridan,” said Mindy Diehl, Senior Companion Program coordinator.